Former British Prime Minister Tony Blair recently stated that air strikes and drones should be used once again on Iraq to stem recent gains by extremists in that country. Mr. Blair is oblivious of the responsibility he shares with former U.S. president George W. Bush on account of one of the most serious breaches of international law in recent times. The prosecution of Mr. Blair and Mr. Bush, along the lines of similar trials conducted in Argentina, Chile and Peru, is the only fitting response to such careless remarks. A reminder of Iraq’s tragic events is in order: George W. Bush and his advisers were planning a premeditated attack on Iraq to secure “regime change” even before he took power in January 2001. Such a plan is described in detailed in the document “Rebuilding America’s Defenses: Strategies, Forces and Resources For A New Century,” written in 2000 by the neoconservative think tank Project for the New American Century. In January of 2003, a group of U.S law professors warned President Bush that he and senior officials of his government could be prosecuted for war crimes if military intervention were to violate international humanitarian law. Similar warnings were given to British Prime Minister Tony Blair and to Canadian Prime Minister Jean Chretien by the New York-based Center for Constitutional Rights. The prosecution case finds strong support in both treaty-law and customary international law, as reflected in the U.N. Charter and the Nuremberg Principles. In February 2006, Luis Moreno-Ocampo, at the time the chief prosecutor of the International Criminal Court, acknowledged having received 240 communications reporting various war crimes committed in March, 2003. U.S. and U.K. officials, argued at the time that existing U.N. Security Council resolutions, issued in connection with and after the first Persian Gulf war, had authorized the invasion. 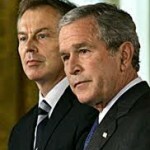 The Nuremberg Principles, which codified long-lasting principles of customary international law, also incriminate the deaths of hundreds of thousands of people, many of them children, and the devastation of a country’s infrastructure on the war sponsored by former Prime Minister Blair and former President Bush. The United States is not a party to the Rome Statute and the International Criminal Court (ICC) created by this treaty, yet as suggested by Michael Ratner, president of the Center for Constitutional Rights, U.S. officials may be prosecuted in other countries under the Geneva Convention. Ratner likened the prosecution of Mr. Blair and Mr. Bush for those crimes to the prosecution of the Chilean military dictator Augusto Pinochet, held under house arrest in London under the orders of Spanish magistrate Baltazar Garzón. Arguably, prosecuting a former U.S. president and a former British prime minister for war crimes is not practical and is likely to cause significant unrest both at the national and global level. However, three Latin American countries, Argentina, Chile and Peru, successfully tried and convicted former leaders to prison for crimes of much less magnitude than those involved in the Iraq war. Perhaps the U.S. and the United Kingdom could follow on those Latin American countries’ footsteps.